President Ellen Johnson- Sirleaf has sent a message of condolence to the Government and People of the Republic of Malawi following the death of Former President Bingu wa Mutharika who died last Thursday as a result of a reported heart failure. 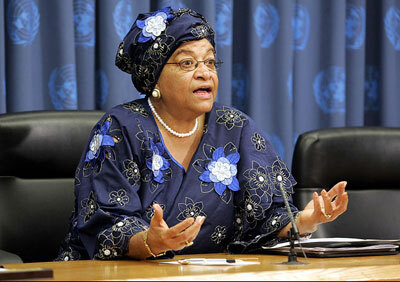 According to a Foreign Ministry release, President Johnson-Sirleaf, on behalf of the Liberian Government, extended heartfelt condolences to her new Malawian counterpart, , and through her to the Government and people of Malawi, particularly the bereaved family for the irreparable loss sustained. “The late President Bingu wa Mutharika will be remembered as an astute statesman and an ardent advocate for African unity and development”, the Liberian leader stated in a letter addressed to the new Malawian leader, Madame Joyce Banda. President Johnson-Sirleaf prayed that as Liberians join the people of Malawi in mourning this sad national loss, the Almighty God will grant them fortitude as they go through the period of bereavement. The new Malawian leader becomes the second female African Head of State after Liberia’s President Johnson-Sirleaf.